Normally this is the spot where I discuss specifics on how a race was won or lost. I did that late Saturday night after the race. 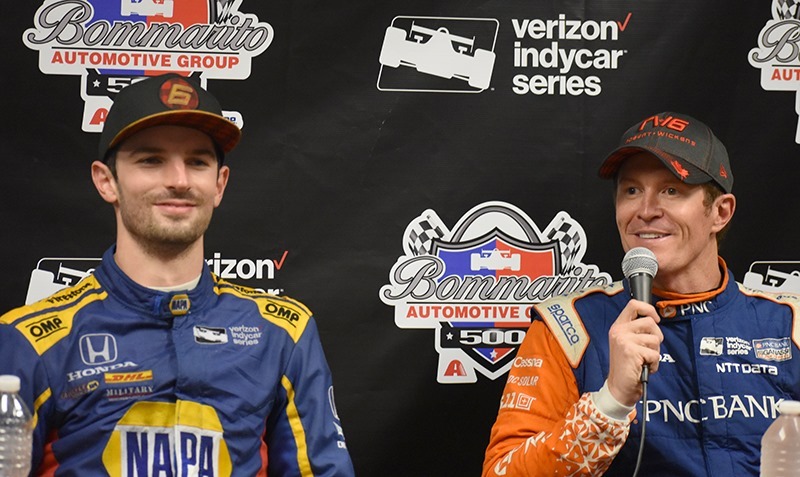 If you want a more in-depth discussion about the race itself, I suggest you read Saturday night’s Gateway Wrap-Up. Today, I’m going to discuss more of the fan experience of going to Gateway as well as other random topics. 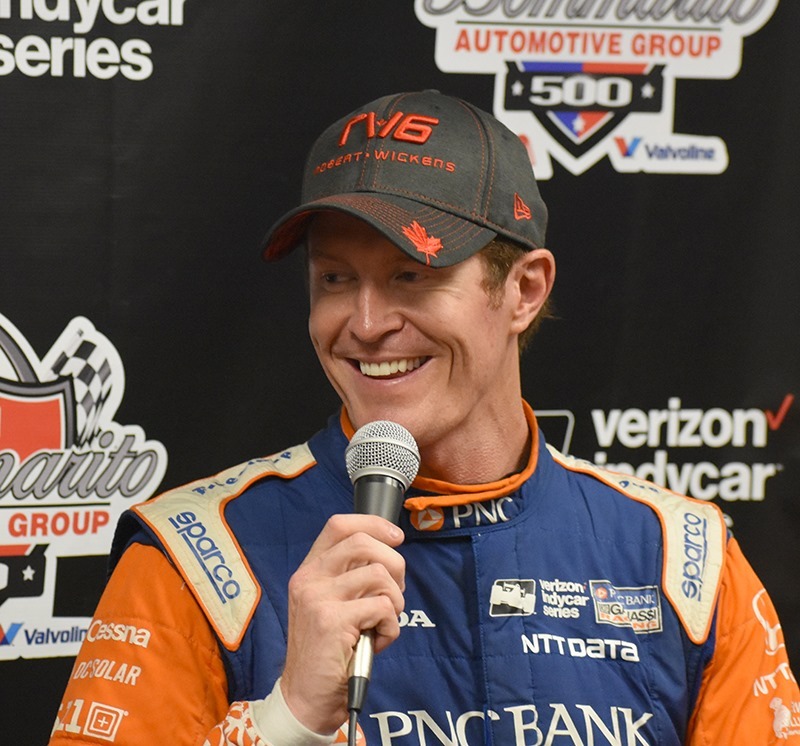 If you’ve never been to an IndyCar race, maybe next year you should circle the date of August 24, 2019. That’s the tentative date for next year’s Bommarito Automotive Group 500. If you’ve never been to any type of IndyCar race in person, this would be a good place to get started. Are there tracks that have better racing? Yes. But few tracks on the Verizon IndyCar Series schedule do as good a job doing everything with the fan in mind. 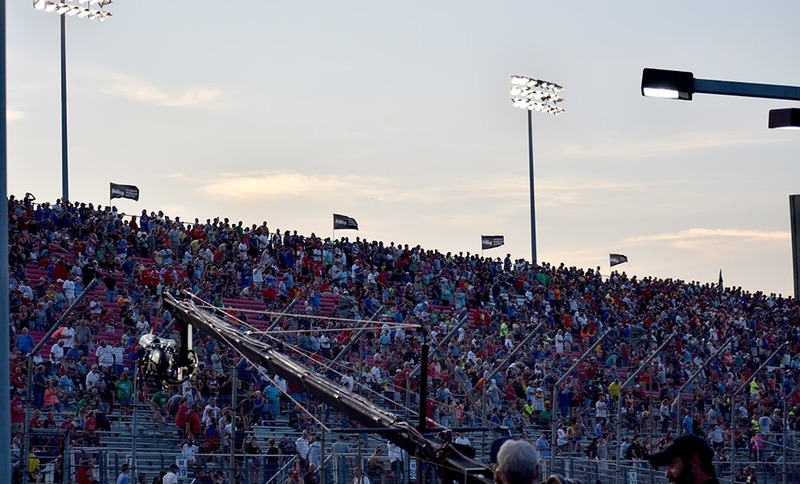 And short of Doug Boles and the Indianapolis Motor Speedway, I’m not sure any oval track does as good a job promoting an event as Gateway Motorsports Park. That’s not to say that the good folks at Barber Motorsports Park and Road America don’t do as good of a job – but their facilities and events are different. They are massive venues with the track spread out across many acres of land. They also host three-day events with on-track activity all day, every day. Attending a road course and an oval are two completely different animals. At a road or street course, spectators tend to mingle and it’s accepted that you won’t see all the action. Well-placed video boards help, but as you go from one vantage point to another, you know you will lose sight of the track at some point. At most ovals, it’s a much more concentrated experience. You can sit in the stands and watch cars go around the track and never lose sight of them. I sat in the stands at Gateway for much of Friday night’s practice and I can confirm that Gateway is one of those tracks. I will re-post a video that I shot during the Friday night practice to demonstrate that point. We were sitting in the lower third of the grandstands and were still able to see the backstretch. 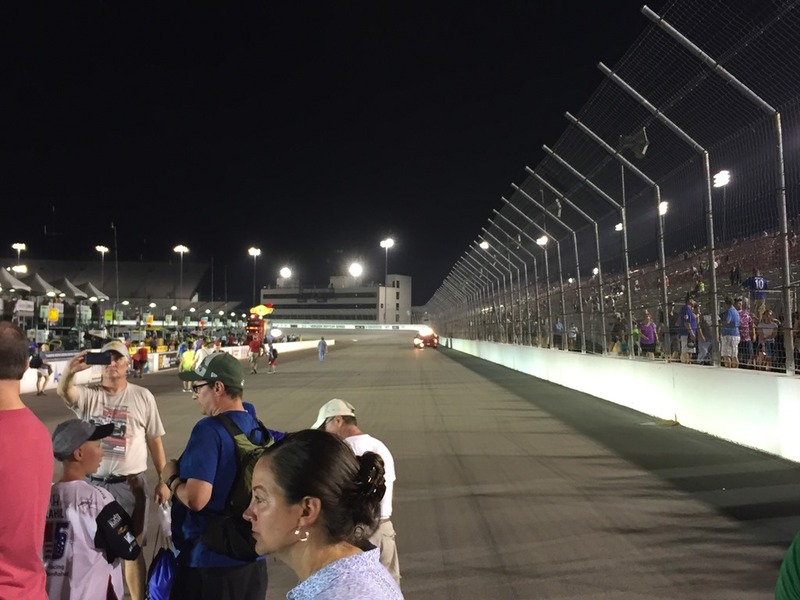 By the time of the race on Saturday night, the transporters in Turn Three were gone, clearing the one obstructed view of the track. I’m sure the higher you go, the better the view. The Bommarito 500 is normally a two-day event; but if you live close to St. Louis and are restricted on time – you can do everything in one. 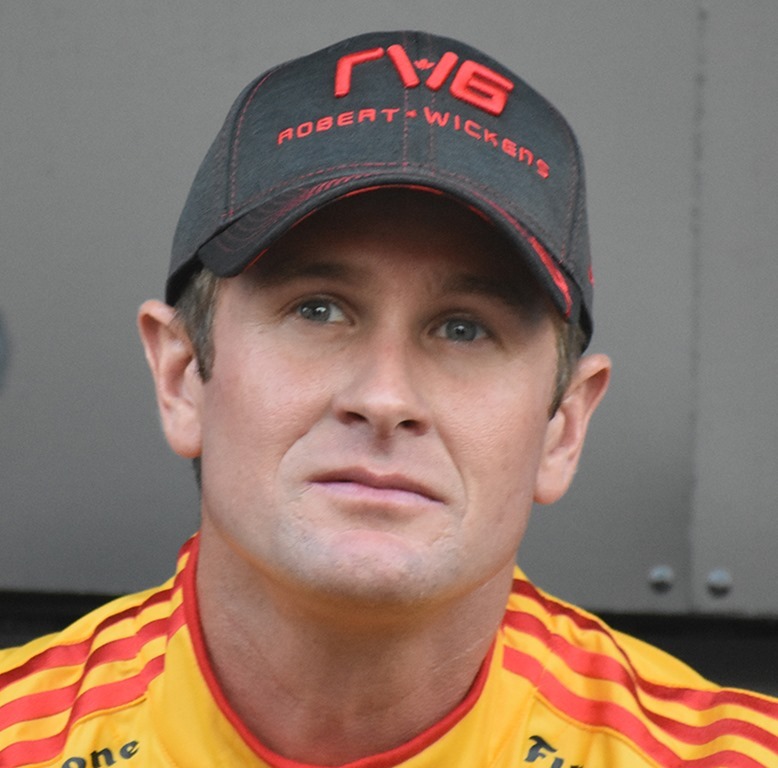 Friday normally has two practice sessions and qualifying. This year, Practice One was shortened by rain and qualifying was rained out. But the Friday Evening practice was extended to an hour and a half and the weather couldn’t have been better. Is there a better way to spend a Friday night than being stretched out in the stands and watching Indy cars go by under the lights? I think not. Saturday was the day things were hopping. 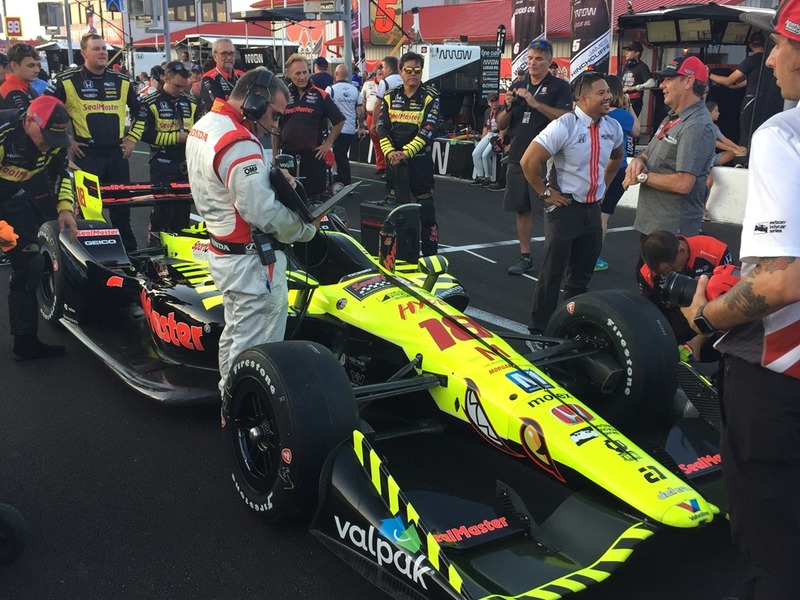 Although the race didn’t start until 7:35 local time, we got to the track a little before noon – and things were already buzzing. The vintage Indy cars hit the track at noon and circled the track for probably an hour and a half. There were roadsters, cars from the 1920’s and 1930’s; as well as the sixties, seventies and eighties. 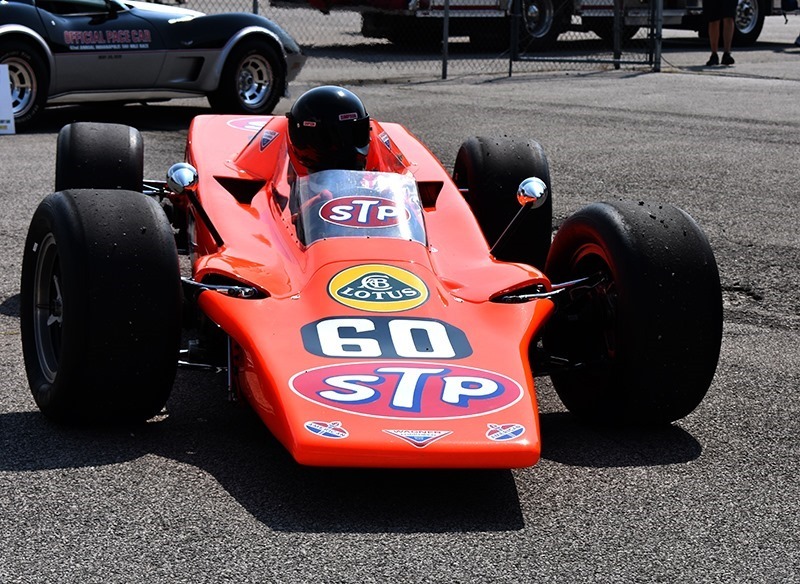 My favorite was the Lotus 56 that Joe Leonard drove (or a replica) in 1968. Not only was it on display, it ran – giving today’s fans a glimpse of what it was like hearing the turbine cars run fifty years ago. While we were back in the display area, it was surreal seeing and hearing that car with that sound coming around the corner and then shutting down. It brought back vivid memories from when I saw that car race as a kid. Then the racing got real in mid-afternoon, as the Pro Mazda and Indy Lights raced. 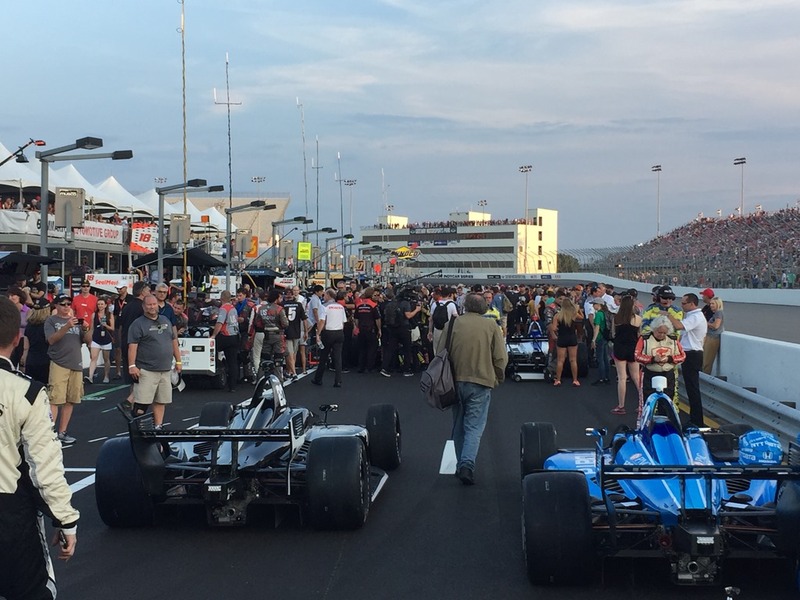 By the time they were done, it was time for the IndyCar Series to grid their cars on pit lane. 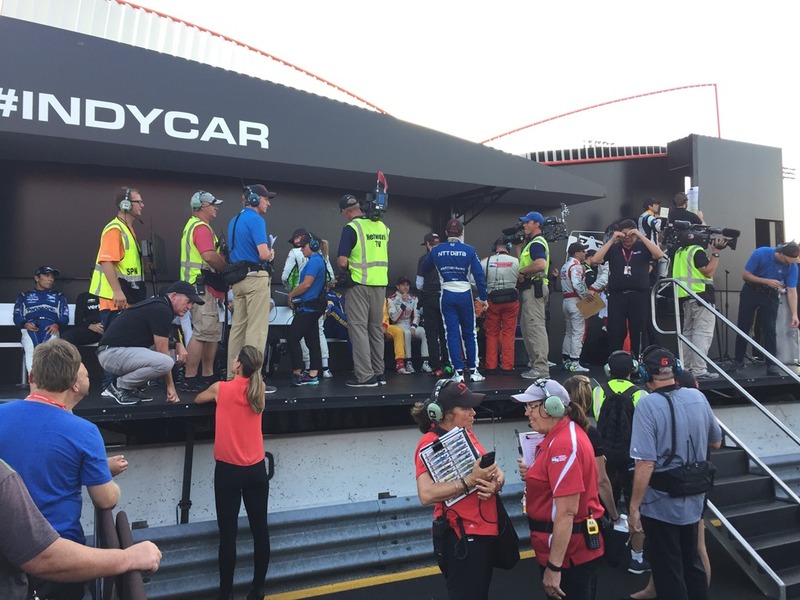 As the fans piled in and the seats filled up, you could feel the excitement building as driver introductions began. 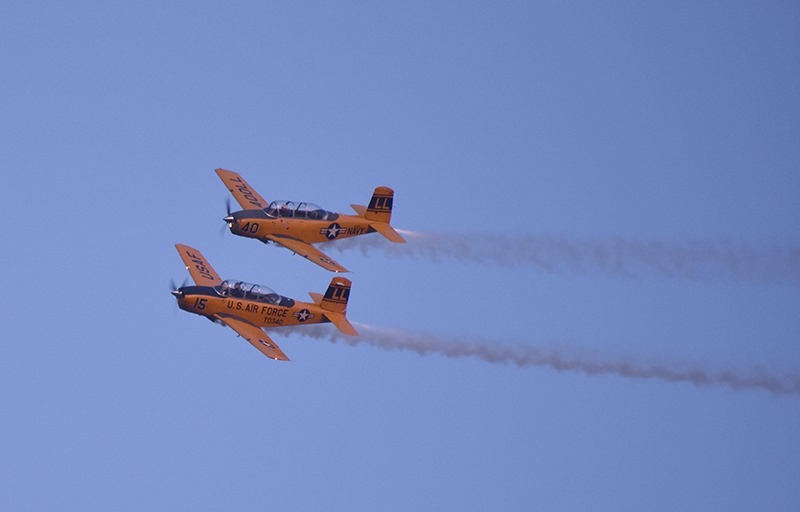 Whoever it was that sang the National Anthem was very forgettable, if not terrible – but that was followed by skydivers delivering a flag by air, and a nice flyover by a pair of T-34s. Then the command to start engines was given by Mr. John Bommarito himself, doing it in the fashion I like by saying Gentlemen, Start Your Engines instead of today’s more popular Drivers, Start Your Engines. Once the race got underway, it was somewhat of a parade in the first half. But then things got interesting after Will Power’s second pit stop. As I said in my post-race write-up on Saturday night – his car was a rocket after that. Watching him carve his way past the front-running cars and into the lead was fascinating. It also disproved the theory that you can’t pass on ovals with this new car. Maybe there wasn’t a pass for the lead on every lap, but from where I was on the inside of the track at the exit of Turn Four – it was good stuff. So, if you don’t have a lot of time on your hands and you’d like a crash course on what it’s like to attend an IndyCar race in person, I’d recommend going to Gateway next year. 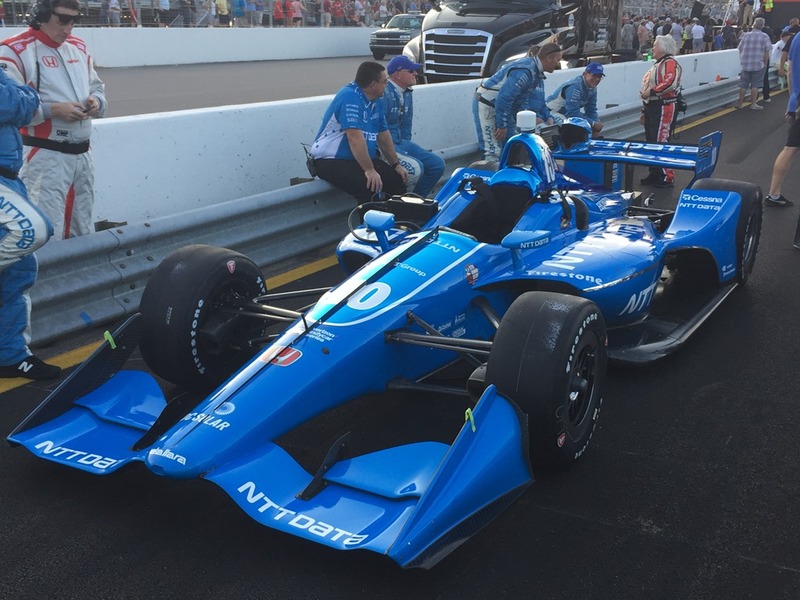 It’s not the sensory overload of going to the Indianapolis 500; but it’s a great fan experience. The track promoters do it right at Gateway. I think their promotion could be a case study in how to promote an IndyCar race. Other tracks should take note. 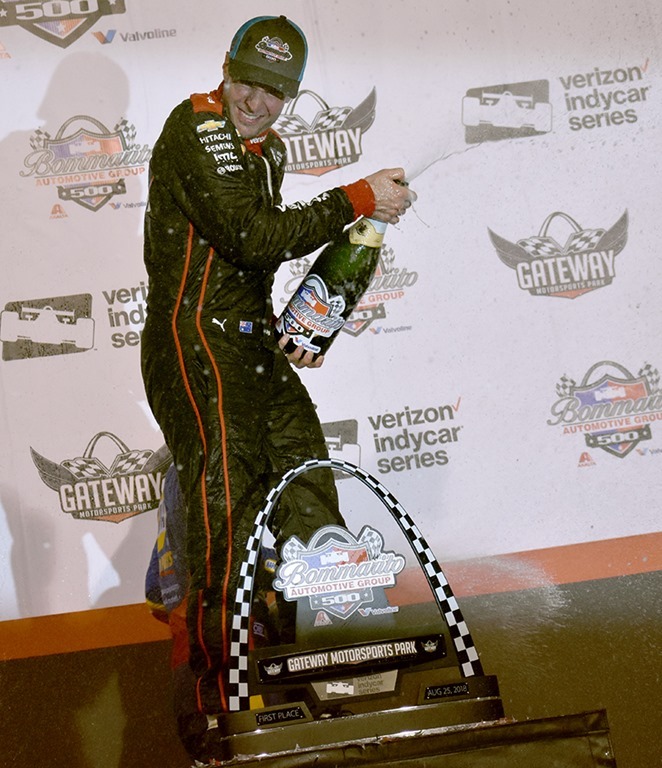 Had ISC and Phoenix put in the amount of effort over the past three years that Gateway has, there would be no gaping hole in the April IndyCar schedule. TV Coverage: Susan and I got back home around 4:00 Sunday afternoon. After unpacking and getting settled, I was able to watch the Pre-Race and Post-Race shows, with a little bit of the actual race as well. If Leigh Diffey ever decided to go do something else, I would have no problem with Kevin Lee in the booth fulltime and Anders Krohn as a fulltime pit reporter. Both did a more than adequate job in their fill-in roles as Diffey was in California this weekend attending the wedding of his best friend. From the parts I saw, there was no drop-off in performance by either one of them. The talent level at NBCSN for IndyCar races runs deep. That brings to mind another question…I couldn’t help but notice that Jamie Little from Fox was in attendance this weekend. IndyCar fans will remember Little from her days of being an IndyCar pit reporter for ABC/ESPN before she jumped to Fox’s NASCAR coverage. Was she just visiting as a fan, or is she interested in coming back to IndyCar in some capacity now that NBC has the entire contract? I heard nothing this weekend to indicate that, so I guess I’m just stirring the pot to even bring it up. What’cha Cookin’? : When this segment debuted a few weeks ago, I’ll admit – I hated it. But somewhere along the way, I’ve come to like it and even look forward to it. It gives us fans a glimpse into the personal lives of the drivers as they cook (or try to cook) in their own kitchens. This week, it was IndyCar rookie Zach Veach who put his culinary skills with Butterball Turkey to the test. He made his version of what he called Street Course Tacos. It looked good as he prepared it, albeit with the required ground turkey. Pit reporters Anders Krohn and Katie Hargitt were the judges, since Kevin Lee was in the booth. Krohn gave Veach a “10” on his effort, while Hargitt gave him a lowly “7”. Why the big disparity? Because Katie Hargitt said it was spicy and she doesn’t like spicy food. I know it’s all in fun, but I thought that was kind of lame. I mean, they’re tacos…Mexican food. It’s supposed to have a kick to it. If Katie Hargitt doesn’t like spicy, she should have recused herself from judging Mexican food. That would be like me judging a lima bean contest – no one would win. Her harsh scoring knocked Veach out of the finals next week. 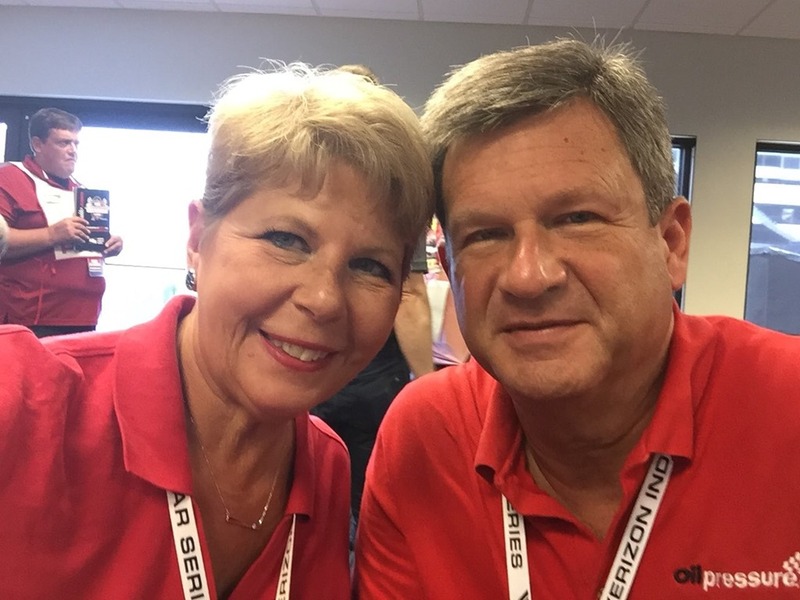 Red for Wickens: Many fans in attendance, including yours truly, apparently got the memo to wear red to Saturday night’s race in support of driver Robert Wickens – who continues to recover in an Allentown, Pennsylvania hospital. 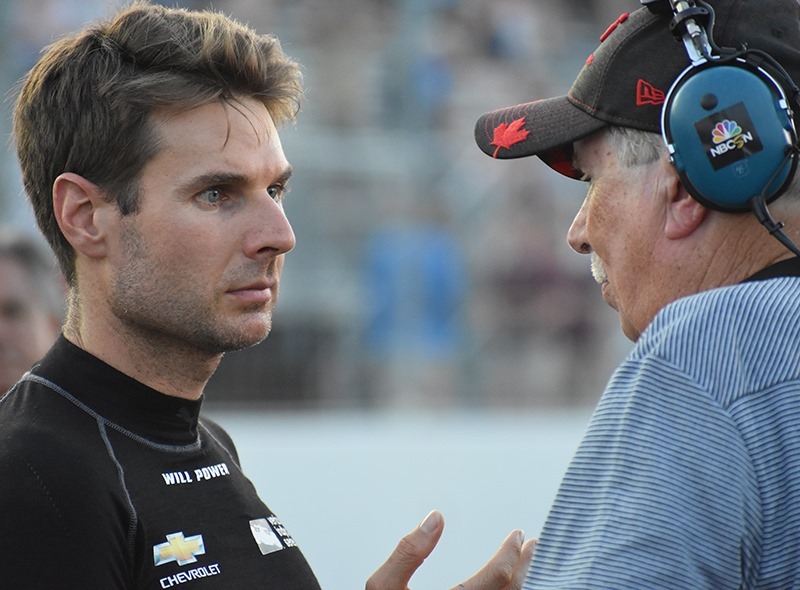 Schmidt Peterson Motorsports released a statement just before the race that said for the first time since the accident, Wickens was able to breathe without medical assistance and he was talking to his family. Robert Wickens was not far from anyone’s mind this weekend. Susan and I looked like twins at the track on Saturday, but we wanted to do what little we could to show our support as well. Drive of the Night: Although Zach Veach couldn’t get past Katie Hargitt’s tough scoring standards, that’s about the only thing he couldn’t pass Saturday night. If you haven’t noticed, rookie Zach Veach has been on a tear lately – even if it hasn’t shown up in results. 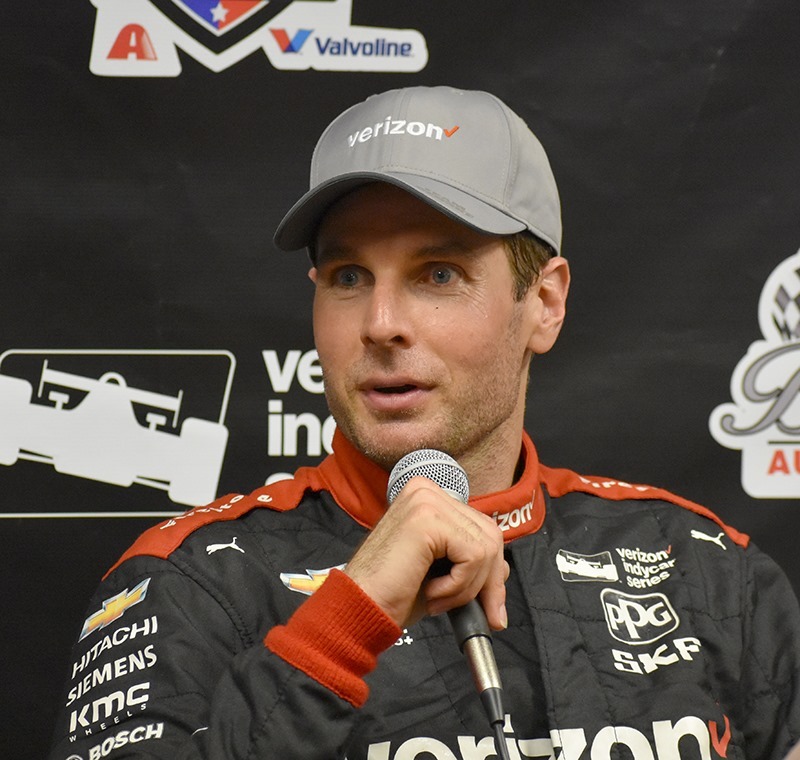 Before Saturday night’s race, eventual winner Will Power said he thought Zach Veach had the strongest car in the field. Power had obviously seen Veach in practice and saw something to make him say that, since Power’s not usually prone to saying things like that for no reason. Veach was fast in both practice sessions, seventh in Practice One and fifth quickest in the extended Friday Evening practice. 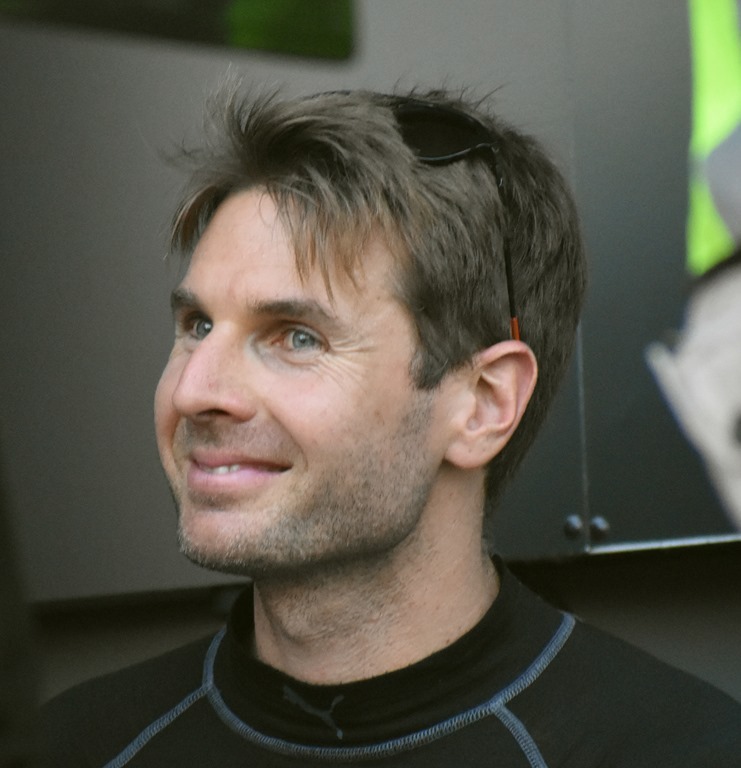 His speed in practice along with his eye-catching driving recently has apparently caught the attention of Will Power. The twenty-three year old did not disappoint. 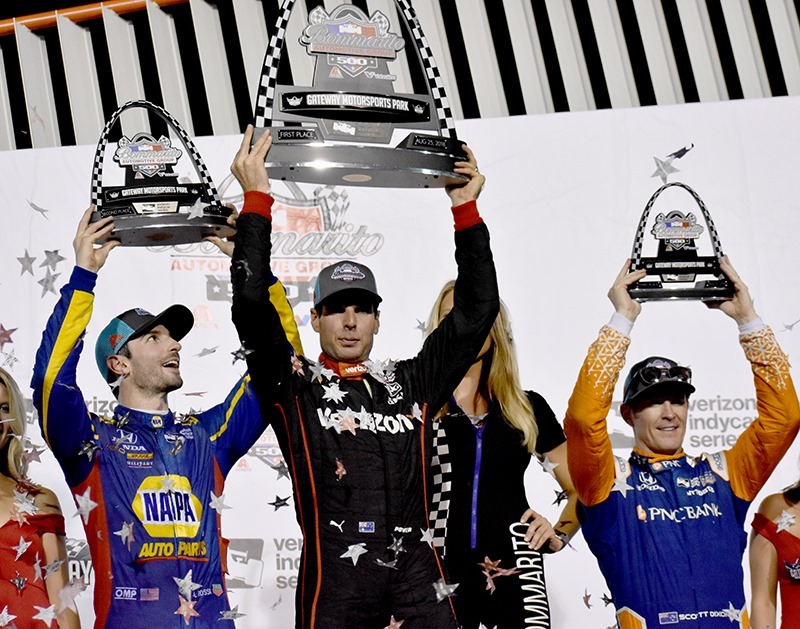 Due to qualifying being rained out and the grid determined by entrant points coupled with his low place in the standings – Veach had to start in sixteenth place. Replay shows he was aggressive from the drop of the green flag. 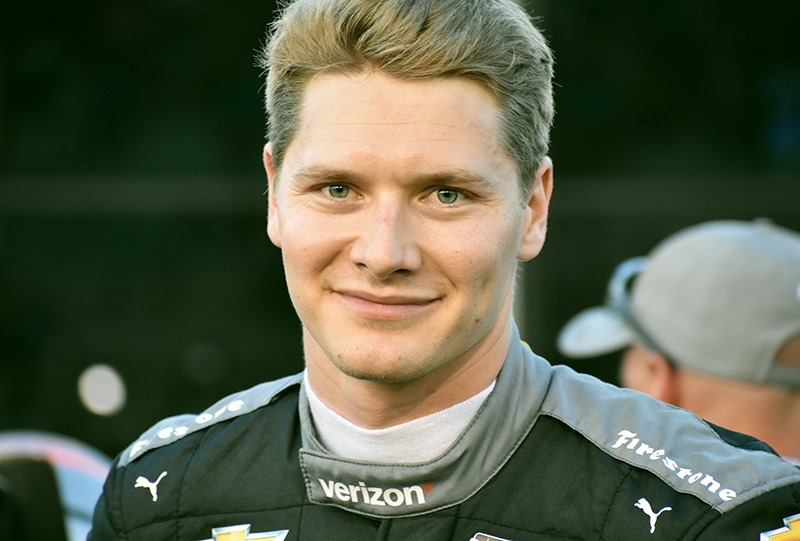 He was so aggressive, he almost got caught up in the spin by Sébastien Bourdais on the opening lap. Veach drove a heads-up race and finished fifth. That was no fluke. He earned that position and also earned the coveted Drive of the Night. All in All: I still have much to watch of the race broadcast. If you’ve ever been to a race in person, you know it’s hard to grasp some of the storylines as a spectator. A lot of blanks are filled in when you go back and watch the replay. From where I was, the race was somewhat of a parade through the first half. But then the action picked up. 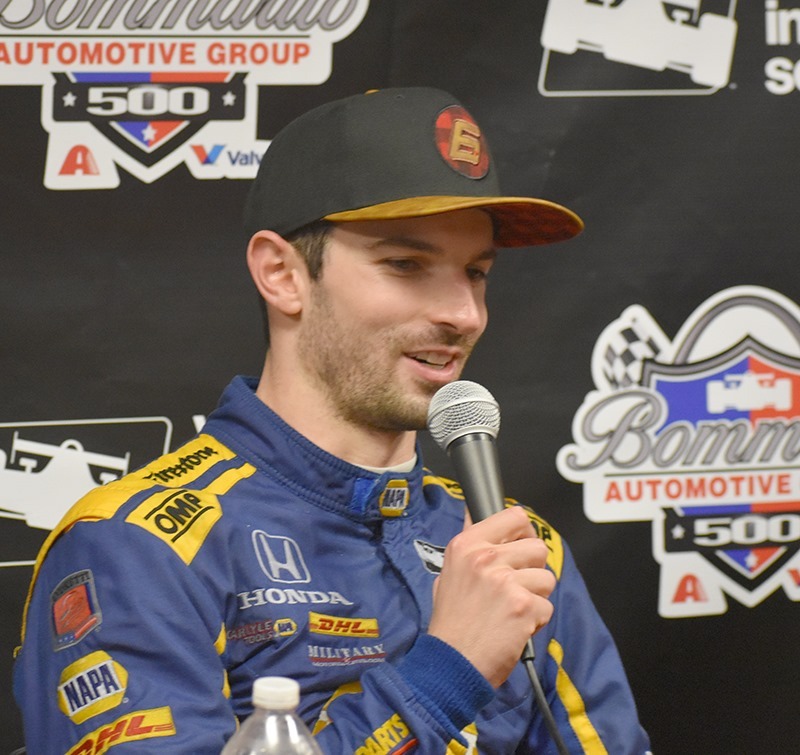 By the end of the race, I knew that Alexander Rossi was trying to make it on three stops. But I thought he was coasting on fumes. I didn’t know he was in good shape, so the race had more suspense for me just because I didn’t know the whole story. Regardless of the lack of information, there is nothing like attending an IndyCar race in person. Television may have the information and the great camera angles, but they cannot replicate the sounds of the engines, the smell of tire smoke or the scent of ethanol exhaust fumes. Nor can they even come close to matching that sense of speed when you are seeing cars whizzing by you at speed. So if you live within a day’s drive of St. Louis and you’ve never been to an IndyCar race; give yourself a treat and go to Gateway next year. You’ll thank me later. I’ll close with some more photos taken by me and Susan throughout the weekend. The better ones are hers. Mine were with my phone, hers were with a real camera – her new Nikon she got for her birthday back in June. That’s one of the many things she does better than me. You’ll have to go through the photos to make comments and to get to the ever-important poll question. Thanks again for following along throughout the weekend. We’ll do it again in less than three weeks from Sonoma. 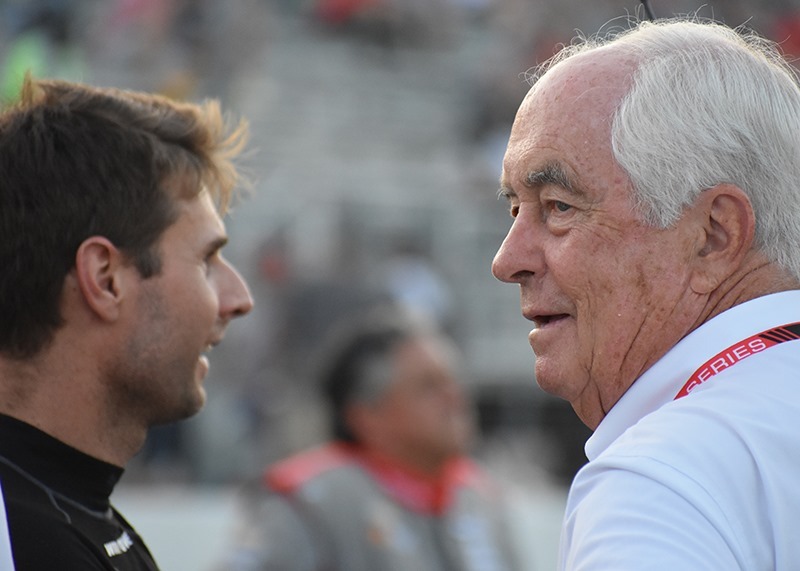 This entry was posted on August 27, 2018 at 4:04 am and is filed under IndyCar. You can follow any responses to this entry through the RSS 2.0 feed. You can leave a response, or trackback from your own site. Gateway made huge improvements from last year. I was impressed with the difference. Glad you got there. Great coverage all weekend. Fun, but exhausting, day. It was so hot and sticky, and a whole lot of walking. Started off slow but ended up being an exciting race. Hope they can figure out a way to get the second groove working, seemed like most of the time someone tried the outside they’d wash up and almost hit the wall. Here’s some of my best shots from the day. 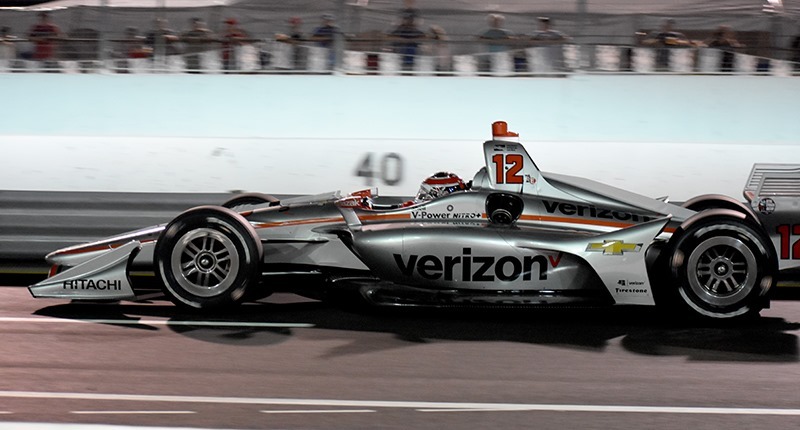 Short ovals are the one type of track that I have never gotten to see an Indycar race at, so I hope to make it to Gateway or Iowa in the not-too-distant future. 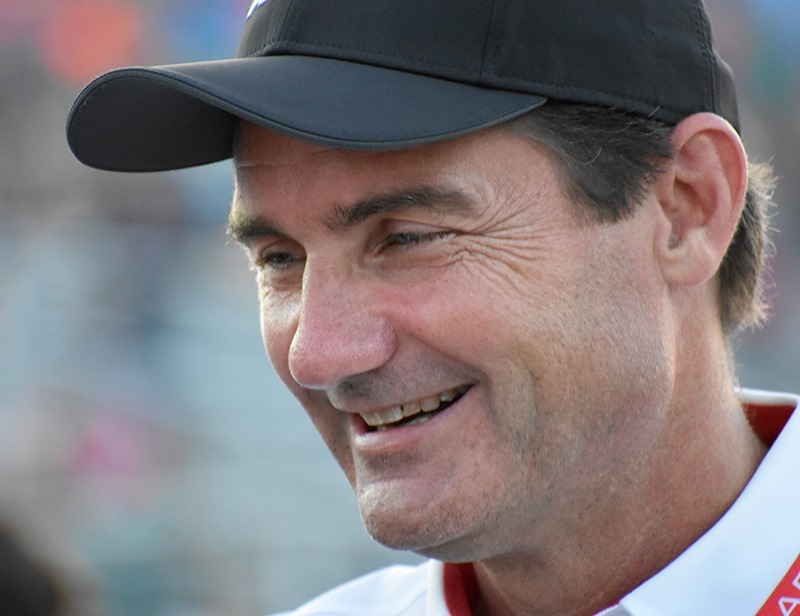 I was pleased with Saturday night’s action and would be happy to see it in person. Don’t look now, but Zach Veach has gone 7-10-6-5 in his last 4 races. I have been very impressed by his improvement. His tacos didn’t look too bad either. This kid from Ohio is amazing, isn’t he! I hope he has good outings in Portland and Sonoma. I would have liked Zach tied with Marco in the cooking contest. Of course they are in the same team and Butterball sponsors a teammate. BTW not all Mexican food is hot! Enjoyed it very much again. I will add that, sitting near the end of the front straight, we heard by engine tone who was saving fuel and who wasn’t. it started just a couple laps after the first restart (appx on lap 9-10). Once I heard that, I knew we might be in for a strategic race. The longer it stayed green, the more it made the what we saw in the first half more interesting for us than it might have been if we hadn’t heard what was happening. Unfortunately for RHR, that last yellow couldn’t have been more perfectly timed to create the most possible chaos in all strategies. 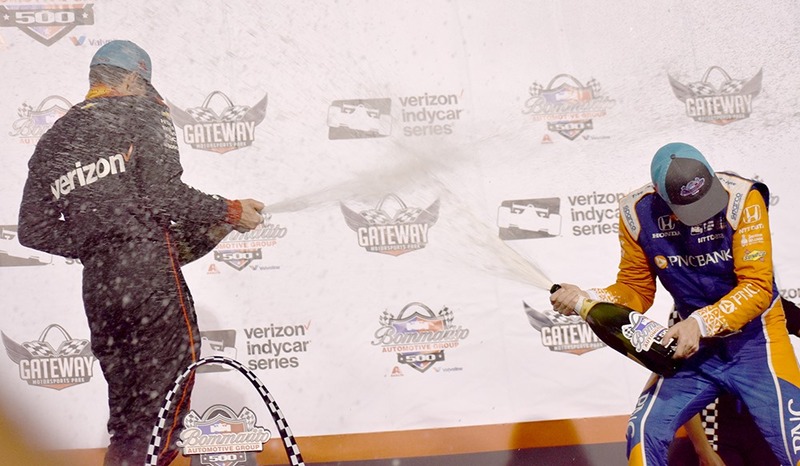 Aside from the race action, everything about Gateway and the Bommarito 500 is really about as good as it gets for Indycar oval fans. Well done! Jamie Little’s ponytail still looks dangerous. 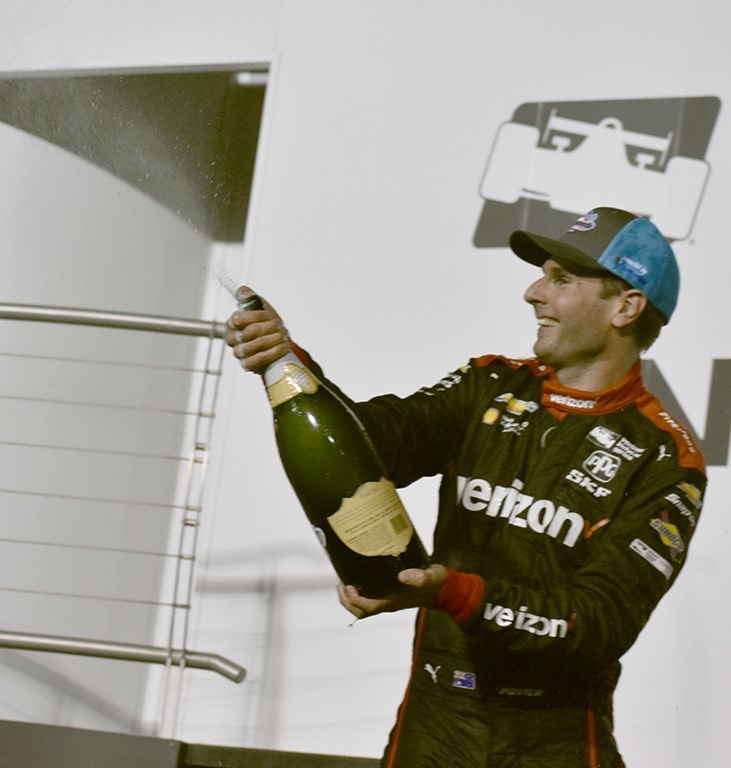 With just a quick look at points, I wonder is Veach can catch Wickens for Rookie of the Year. It might take three wins, but it might be possible.